Please join us for a Migrant Voice Media Lab in Wolverhampton on Tuesday 26 March to learn media tools for telling your story. Recognised journalists, media and communication professionals will lead the sessions to help us get more migrant voices heard in the media. 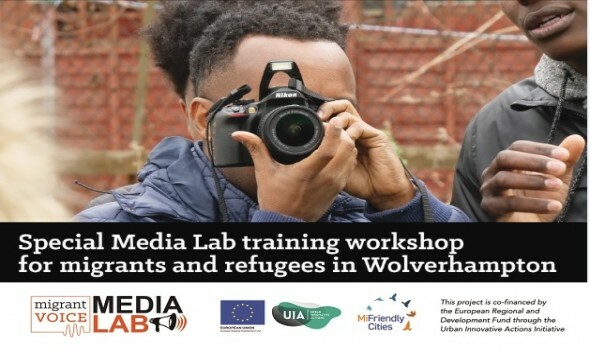 Migrants, refugees and asylum seekers living in Wolverhampton, please join us to learn media skills and tell your stories. Venue: Refugee and Migrant Centre, 1st floor Roma Parva, 9 Waterloo Road, Wolverhampton, WV1 4NB. Date: Tuesday 26 March, 2019. Time: 12:00 PM to 5:00 PM. Venue: Refugee and Migrant Centre, 1st Floor, Roma Parva, 9 Waterloo Road, Wolverhampton, WV1 4NB. The sessions are free and there will be some refreshments. For early registration please contact selbin@migrantvoice.org or 07516399929.